Amazing Alex is the first physics-based puzzle game created by Rovio Entertainment since Angry Birds. Now you don’t have to always pull the Bird to get rid of those pigs, you have Amazing Alex here to let your logic juices out, with this whiz kids boundless imagination, he turns everything into adventure! From cleaning his room to battling cardboard robots in his backyard, Alex creates amazing chain reactions to get the job done. Now he has some challenges for you! What’s the most creative solution YOU can create? With 100 challenging levels, there’s a whole world of creations to explore! There’s more than one answer to these ingenious puzzles! Share your most creative solutions with your friends and see what they came up with! 1. Download BlueStacks installer from official BlueStacks website, www.bluestacks.com. 2. Run BlueStacks installer on your PC and wait until installation process complete. 3. 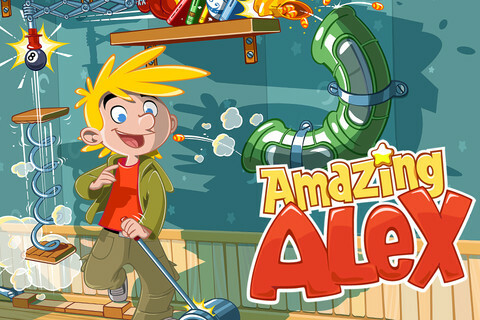 Search Amazing Alex apk (android installer) on internet and download it. 4. Open your downloaded apk and it will automatically installed on the emulator. Now you can Run Amazing Alex on PC via BlueStacks. Let your Physics Mind play with it. Let the Logic Juices come out with Amazing Alex.